Although most macaques are found in Asia, Barbary macaques hail from the mountainous regions of Algeria and Morocco on the African continent, with a small population also in Gibraltar. Other than human beings, they are the only free-living primates in Europe! 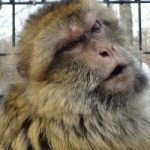 In a trait unique to primates, males in Barbary macaque communities help raise the infants, even if they are not genetically linked. Barbary macaques are a yellow-brown and gray color with a dark pink face, and they have a small vestigial tail. In the wild, they can live 25-30 years and grow to be 2 feet tall, weighing over 30 pounds. Despite being declared an endangered species, Barbary macaque populations are declining due habitat destruction and illegal poaching that fuels the overseas pet trade. Saidah was rescued from a defunct Las Vegas zoo. She is an animated girl, who enjoys seeking out tasty vegetables and watching all that’s going on around her.